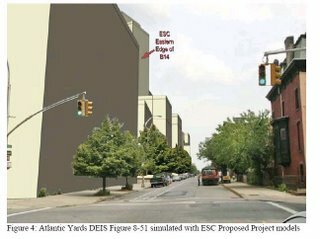 At 1 pm today, just a half day before the close of the comment period regarding the Atlantic Yards Draft Environmental Impact Statement (DEIS), the Council of Brooklyn Neighborhoods (CBN) plans to deliver a detailed and harsh set of criticisms to the Empire State Development Corporation (ESDC). 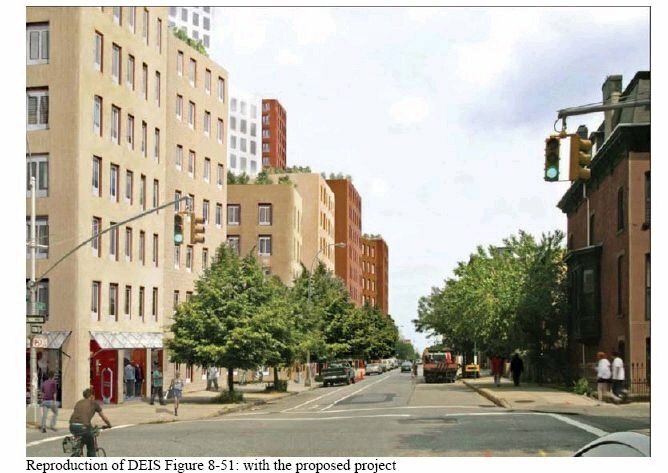 CBN, a coalition of some 40 community groups active in Community Boards 2, 3, 6, and 8, gained $230,000 in discretionary appropriations from city and state officials to hire experts to respond to the massive DEIS, which was issued July 18. CBN is officially neutral on the Atlantic Yards plan, but several of its constituent organizations have opposed it or been strongly critical. The full response, which runs to hundreds of pages, will be posted on the CBN site Saturday, but preliminary versions released Thursday paint a disturbing picture. 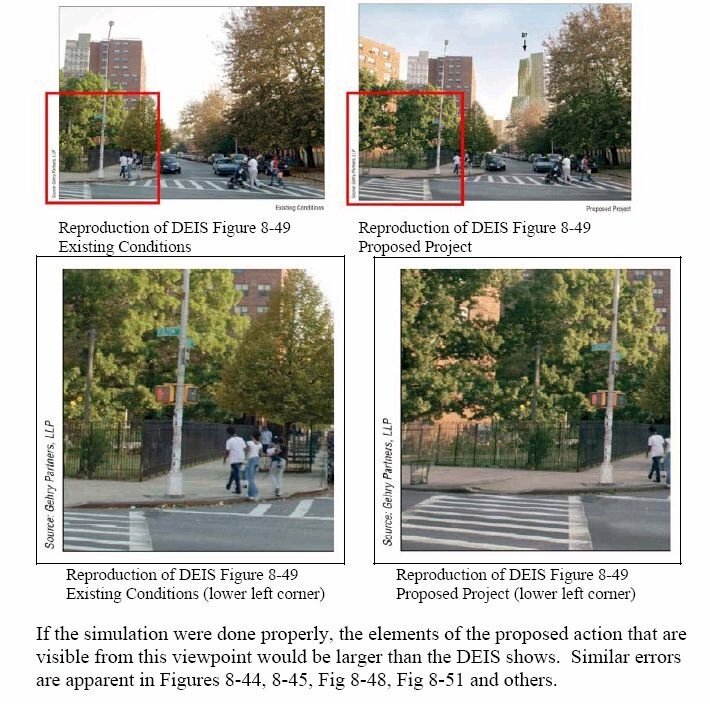 One example: while the DEIS portrays the planned open space as green and unsullied by shadows (first graphic above), a shadow analysis (second graphic) suggests that in spring it would be hard to get much sun in that space. • Land Use and Public Policy. 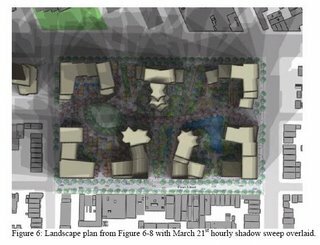 The project sharply breaks with the City’s land use, zoning and redevelopment policies. • Socioeconomic Conditions. The DEIS fails to disclose public costs and understates secondary displacement. • Community Facilities. The project could have adverse impacts on community facilities, but due to faulty methodology, (incorrect calculations) no analysis was performed. • Open Space. 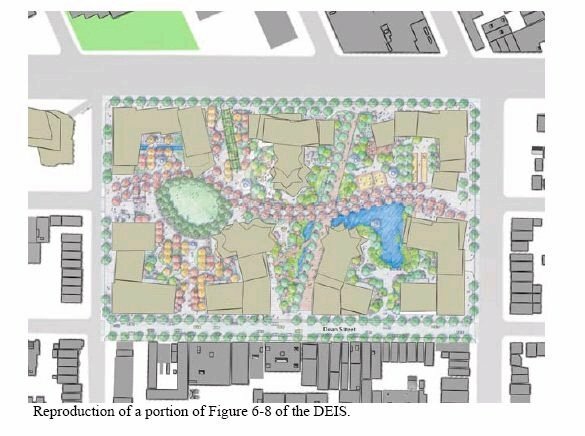 The DEIS underestimates the open space deficit and inappropriately identifies private space as public. • Cultural Resources. The impact of the project on historic districts is not accurately assessed. • Infrastructure. The DEIS fails to demonstrate that there will be no significant impact on Combined Sewer Overflows despite proposed mitigations. • Traffic and Parking. 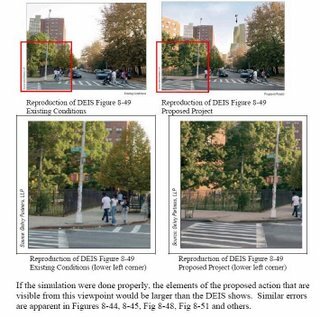 Cumulative traffic impacts beyond the effect on intersections are not addressed. • Transit, pedestrians and bicycles. Crowding on transit and risks to pedestrians and bicyclists are underestimated. • Public Health. Significant air quality, noise, shadow, and displacement impacts will have adverse effects on public health. Because those impacts are not disclosed, there's no mention in the document of appropriate mitigations. The DEIS, he wrote, failed to seriously evaluate alternative plans and failed to provide adequate mitigations for the impacts disclosed. Moreover, while ESDC was "partially responsive" to requests for backup data, it did not fully respond. Thus, he argued, the state should issue a Supplemental DEIS before the ESDC board decides to approve the project. The ESDC must respond to the comments from CBN and others with a Final Environmental Impact Statement (FEIS). "The report will be taken into consideration along with all the comments we receive on this project,” Deborah Wetzel, a spokeswoman for agency, told the Times. After the FEIS, the ESDC board is expected to approve the project. However, a lawsuit over eminent domain is expected, which could stall the approval process. I and others have pointed out the flaws in the ESDC's fiscal impact analysis, and the chapter on Socioeconomic conditions notes several subsidies ignored, all of which cut away at the claimed $1.4 billion in net new revenue. 4) Non-competitive bid for the railyard rights. 8) Mortgage recording tax exemption. Also, the project would increase public costs, such as for schools, but the DEIS does not estimate such costs, the response notes. 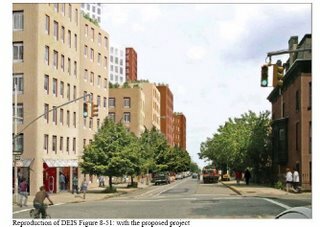 Moreover, while the DEIS considers "externality-type issues," including shadows, noise, and congestion, it makes no attempt to evaluate the cost of such issues, though Brian Ketcham of Community Consulting Services estimated that additional traffic would cost millions in congestion, traffic accidents, air pollution, and other problems. 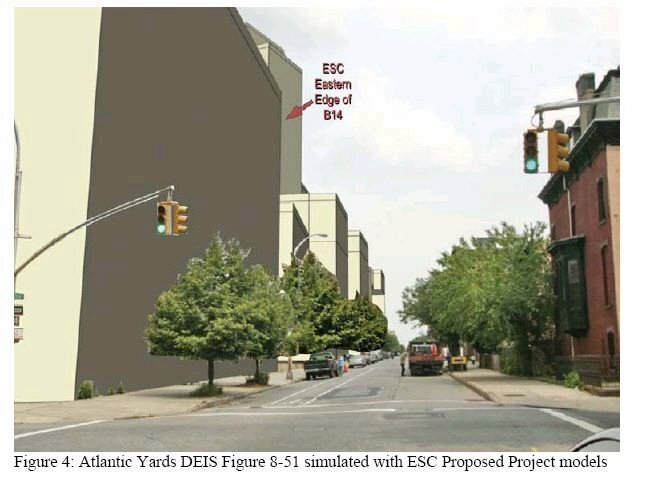 While the Atlantic Yards plan would destroy rather than reuse two buildings of historic merit, the Long Island Railroad Stables and the Ward Bakery, the response points out that new developments can incorporate historic structures, as in the example at right from San Diego. While there are some 20 chapters to the response, tracking the sections of the DEIS, I'll point at two particularly contentious ones. Noise: just lock your doors? The consultants believe that by sealing people in their homes, the expected significant noise impacts will not impact upon them. This assumes that people will agree to be sealed into their homes. In cooler temperatures, people do open up windows and individuals have this right; even in warmer temperatures, individuals may wish to open their windows.... The proposed mitigation would undermine Brooklyn’s well-known “stoop culture,” condemning everyone who chose to meet with friends and neighbors on the block to adverse health risks. It would also undermine any benefits there might be to the network of “publicly accessible open space” planned for the project. 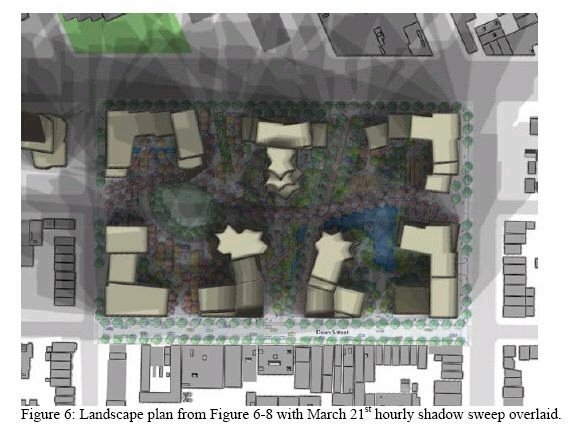 On the one hand the plan promises more than seven acres of public open space and then tells residents to stay in their apartments with their windows shut. The CBN response accuses the preparers of the DEIS of bad faith--on the level of the tobacco industry--in assessing the health effects of fine particulate matter, PM2.5, since the state seems to be contradicting itself. The DEIS discussion, according to the response, appears to have been written by or copied from material written by Dr. Laura Green of Cambridge Environmental Inc., a consultant often hired by polluting industries to defend their practices. Dr. Green prepared testimony for power plant proponents NYPA and TransGas in connection with recent hearings regarding New York State Article X, which has to do with the siting of power plants. The DEIS material appears to have been taken in part from that testimony. Dr. Green’s views regarding the health effects of PM2.5 and of EPA’s National Ambient Air Quality Standards (NAAQS) for PM2.5 are considered extreme, and they run counter to the State of New York’s position. New York State has participated actively in the legal defense of EPA’s PM2.5 NAAQS against industry challenge.